After a month of traveling through India, culture shock, like the layer of dust on my belongings, has finally started to settle. The orange-brown that coats me is my symbolic shield representing an armor of thicker skin and stronger stomach lining. My neck has started to relax from having my head on a swivel and my wide eyed skepticism has softened. Finally, I’m ready for India. The last month brought day after day of rough travel. India is not for the faint. It requires a lot of you. Every meal is served with a side of fear. The worry of becoming ill is constant. On a regular basis, travelers swap horror stories of being sick. It seems inevitable. It follows like a shadow, always just over your shoulder. But alas, one must eat. The seemingly friendly but incessant questioning that always starts and ends the same is draining. “Where are you from? How long are you here? How long do you stay? Where are you going? Come into my shop. You need a tuk-tuk? I have very good price.” Sure that sounds innocent enough but repeat it ten times with answers every half minute while trying to play real life road frogger, horns screaming from all directions, dodging cow and dog feces, and scanning for landmarks in lieu of street signs to keep track of your location amongst the chaos. A local man walks up to Sam and asks for a photo. Sam responds with a shrug and a “sure”. Before he can make sense of the situation he sees the man step next to me, without even looking at me or saying one word, firmly place his arm around me, smile, and wait for the picture to be snapped. Not completely sure of what just happened I can only imagine this man now has a picture of me bug-eyed with a confused smile. Sam, now fully grasping the situation is at this point wearing a grin. He hands the man back his camera. The man then thanks Sam. HE THANKS SAM! Not me! To the man’s already turned back I wave and shout a facetious “your welcome” which is drowned by the sound of our laughter at whatever just happened. This scenario will occur over and over and over. India as a whole is incredibly crowded. It’s dusty and loud. I’ve never seen so much plastic littering the streets in my life. It’s unorganized and yet requires a ton of paper work. I now can laugh every time I have to fill out a form about a form that I just filled out with the exact same information as my passport that has just been copied. The simple act of taking a train requires tedious paperwork, a long line, unhurried workers, all the keys on a keyboard to be punched, stamping, printing, all to receive a ticket that conveys no real information regarding your trip and for your ticket to never be checked once on said train. India really tests your patience and makes you question reason. With all that said, since we’ve moved south, things are getting easier. The fear of food has become a sporadic after thought. Delicious food is everywhere. The men are far less brazen. The hustlers are more tame. People in general are more laid back. Unnecessary extra steps are met with less hesitation and effort to understand. I see past the shock. I trust more easily. Come to think of it, I’ve not had my picture taken in a while. Perhaps I’m becoming desensitized or acclimated. Maybe it’s just the illusion that comes with being in the notably progressive, clean, modern city of Bangalore. Here, we’ve joined two good friends and fellow Chicagoans for further exploration of India. We were lucky to meet a friend of a friend in the restaurant industry who treated us with the upmost, unexpected hospitality. We finally had a great meal and have been in excellent company. A trip to the country has shown me a new side of India. 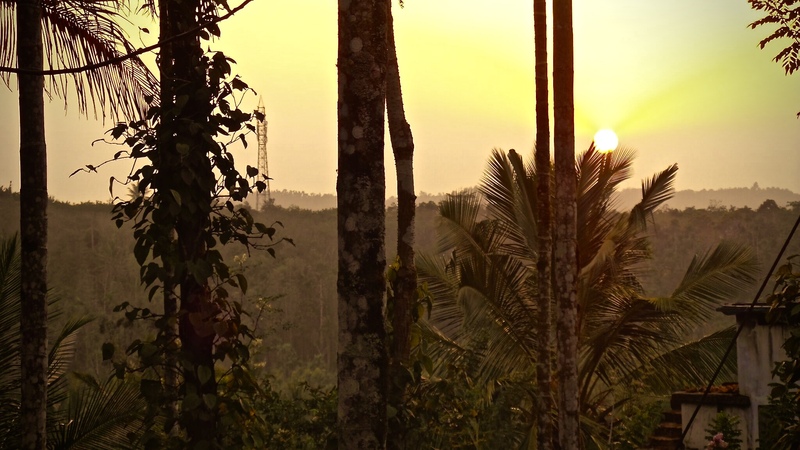 The Kerala region has impressed me with food, abundant nature, and friendliness. Perhaps it’s small world connections, sharing experiences with people you care about and the out of the way kindness of strangers that are simply becoming more recognizable with the settling dust. This is when great things start to happen. It’s when the dust settles, and no longer blinds you, when you are no longer distracted that it’s become embedded in the fiber of your being and your fabrics, that you start to see how vibrant your surroundings are, making the discovery of great things and people quite easy. Looking back, I can now see the details and differences in the regions of India unlike before. The last month has been a whirlwind yet I am gaining a clearer perspective. I can now easily recall when locals were being genuinely kind or helpful. In the moment, fear or skepticism kept me from appreciating some situations. I look back and think of times when we lucked out. India has captured me. I look forward to reflecting on how I’m left feeling in yet another month under different circumstances and new adventures.